Premiere performance 10.10.2015 during the 44th Festival Nouveau Cinéma, Montréal, Québec/Canada. Subsequent performances include Lab30, Augsburg, Germany (October 29, 2016), Ausland, Berlin (November 4, 2016), Tsonami Festival de Arte Sonoro, Valparaiso and Santiago, Chile (December 8/14, 2016). Using field recordings, cottage-built electronics, analogue tape and feedback systems, Friz and Korabiewski perform live, accompanied by Friz’ monochrome two-channel photo-montage. Together, they craft pensive audiovisual landscapes, strongly influenced by the extreme oscillation between daylight and darkness characteristic of life over a year on the mountainous coast just below the Arctic Circle. Fjarðarheiði is taken from the name of the 25 km mountain pass which connects the village of Seyðisfjörður to the nearest town of Egilsstaðir in eastern Iceland. 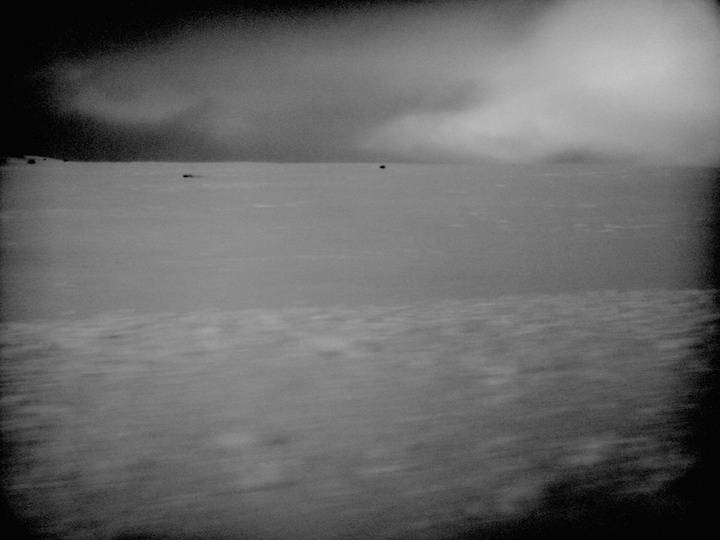 On this sometimes treacherous road, the visual and acoustic environments are transformed by dense fog and snow storms, effecting a perceptual flux between white-out and black-out which leaves only an aftergrain. If afterglow refers to the light or luminescence left in the sky after sundown, after-grain is the sonic and visual noise that remains when most other frequencies are subtracted.